The Ebony Jewelwing frequents ditches with moving water and shade. 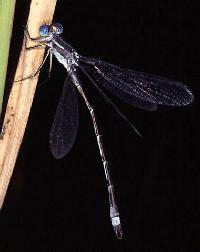 Lyre-tipped Spreadwings are often found in meadows and prairie areas quite distant from water. 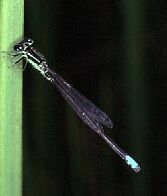 Eastern Forktail is the most common damselfly at Ojibway. 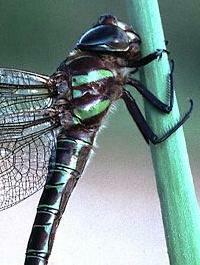 The Swamp Darner is our largest dragonfly. 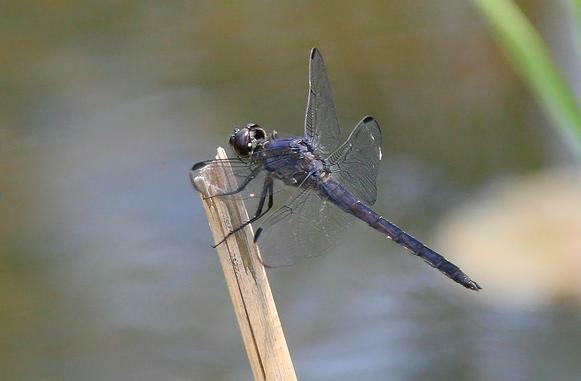 The best locations to observe dragonflies in the Ojibway area include the pond in front of the Nature Centre and the ponds at Tallgrass Prairie Heritage Park. The mouth of Turkey Creek at the Detroit River is a good location for stream species. Many odonates wander far from water and can be found in open areas and along trails. The following sixty species are listed as (C) common to abundant, (U) uncommon, and (R) rare to single occurrence. Common names follow usage by the Dragonfly Society of the Americas . 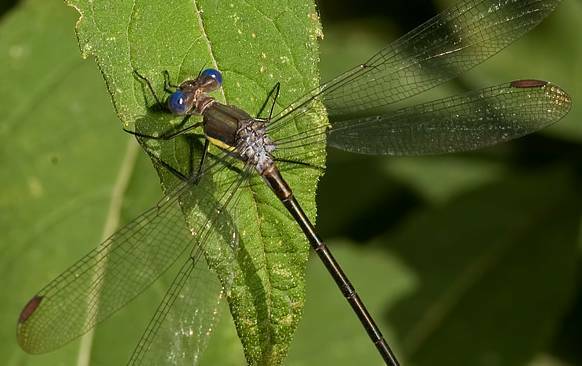 For more information on dragonflies visit the Odonata Information Network and the Michigan Odonata Survey . Beginner's Guide to Dragonflies by Blair Nikula, Jackie Sones. A Stokes Guide. This is a pocket sized photographic guide to more than 100 species of dragonflies and damselflies commonly found in the USA. Over 80 % of all the species recorded from Ojibway are pictured in this handy guide. Copies are available at the nature centre for $13.95. Link to: Odonata of Ontario with county lists. Pratt, Paul D. 2013. Damselflies & Dragonflies of the Ojibway Prairie Complex (Version 22JULY2013). Ojibway Nature Centre Home Page. Department of Parks & Recreation, Windsor, Ontario. Copyright © 2000-2013. All rights reserved. You are on the City of Windsor World Wide Web Site.